What is the relationship between ancient Hebrew texts and the mission of the church in the 21st century? Missionaries have always drawn upon the Old Testament for comfort, inspiration and encouragement. Sadly, this grasp of the vitality and relevance of the Old Testament to mission has not always been a feature of mission thinking. In recent years, however, there have been an increasing number of books and articles on the subject. 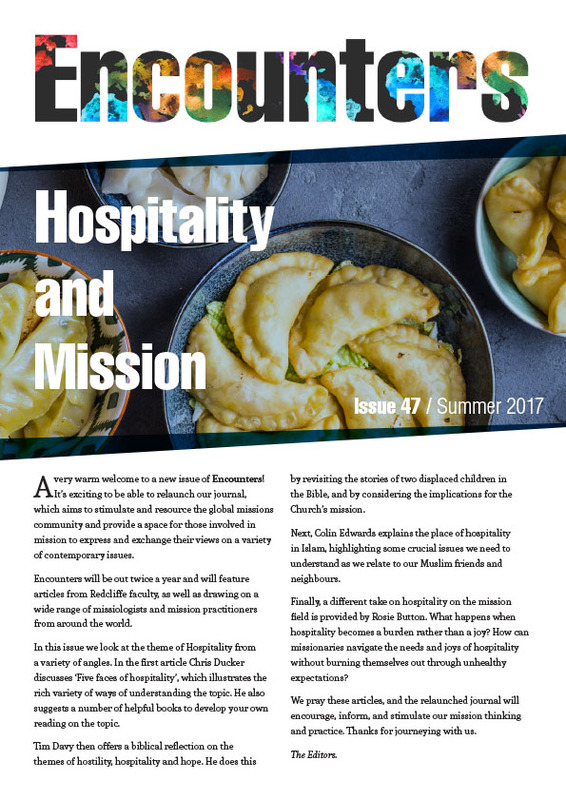 This issue of Encounters launches what we hope will be a significant and ongoing contribution both to the study of the Old Testament and to the study and practice of mission. The Mission and Old Testament project is a new venture based at Redcliffe College that seeks to encourage thinking, writing and discussion on the relationship between the Hebrew Scriptures and the theory and practice of mission. In my editorial I give an outline to the project and invite you to contribute. Whether you are a student or scholar, mission agency or practitioner, we would welcome your input. We have much to learn from each other. One of the most significant writers on mission and the Old Testament in recent years is Rev Dr Chris Wright. It seems appropriate, therefore, that we launch our project with a celebration of Dr Wright’s latest book, which is a monumental treatment of the subject of mission and the Bible. The Mission of God: Unlocking the Bible’s Grand Narrative has been touted as the most important book on mission since David Bosch’s Transforming Mission. With this in mind, I interview Dr Wright about his book and explore with him some of the issues it raises both for academics and practioners. So who do you ask to review a book that spans both mission and the Bible: a missiologist or a biblical scholar? Why choose?! We are indebted to Prof Gordon McConville, Professor of Old Testament at the University of Gloucestershire and Dr Kang San Tan, Head of Mission Studies at Redcliffe College, for their penetrating engagements with the book. Reflecting the eclectic possibilities of the Mission and Old Testament project, the remaining articles look at the relationship between mission and the Old Testament from a variety of perspectives. Both theory and practice are embraced – an ethos at the heart of the Mission and Old Testament project. In A Kiss from Heaven, an Old Testament scholar working in Central Asia discusses how Abraham might be a model for mission and society. This is an intensely practical issue given the context he is writing in. In Preaching the Old Testament in the Majority World, Stuart Reid reflects on his experiences of preaching the Old Testament cross-culturally, particularly in poorer settings. Stuart offers much helpful advice to preachers and reveals a number of cross-cultural issues and surprises connected with the Old Testament. As well as rigorous scholarship, the Mission and Old Testament project is also committed to the vitality and transformational nature of the Scriptures for all peoples, including those working in cross-cultural contexts. For the final article we have gathered first-hand stories from around the globe on how the Old Testament has shaped the experiences of missionaries, and vice versa. It is a superb reminder that missionaries have always been at home in the Old Testament. We scholars have some catching up to do! Even this month’s Country Profile, which focuses on Lithuania, continues the Old Testament and Mission theme. Our Lithuanian writer uses a wonderfully imaginative narrative to explore how the creation account in Genesis would be read in a pagan context, and how Christians might use this as a starting point to genuine discussions about Christianity. We have two book reviews this month. The first looks at the Africa Bible Commentary, an exciting and important collaboration of African scholars. The second review considers the chapters on Old Testament in a Spanish language book on Bible and Mission. It is precisely because most of us will not be able to read this book that we include the review here. We have also made this review available in Spanish. So, enjoy issue 17 of Encounters. I hope you too capture the excitement of this new venture. Article Mission – What the Bible is All About: An Interview with Chris Wright. Chris Wright’s The Mission of God: An Old Testament Scholar’s : Perspective. Chris Wright’s The Mission of God: A Missiologist’s Perspective. A Kiss of Heaven: Abraham, Global Blessing, and Civil Society. Preaching the Old Testament in the Majority World. Shaping Life and Ministry: Missionaries and the Old Testament. Book Review 1: Africa Bible Commentary. Book Review 2: Bases Bíblicas de la Misión: Perspectivas Latinoamericanas. Review in Spanish. Book Review 3: Bases Bíblicas de la Misión: Perspectivas Latinoamericanas. Review in English. Country Profile: Pagan Religion and Genesis 1: Obstacles and opportunities in Lithuania. Issue 17: Single Document Version (in full).